Hi, this is Olivia with Maids In America, the highest rated and most reviewed cleaning service and A+ rated with the Better Business Bureau as members. 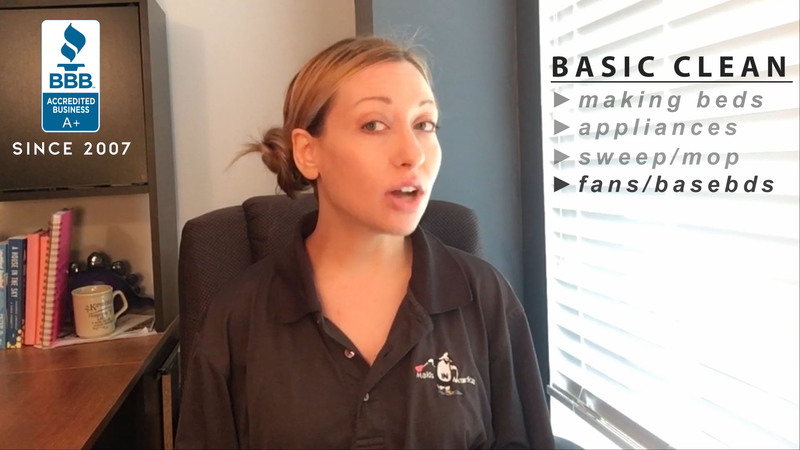 In this VLOG I will give you an overview of our cleaning options. Remember that you can get a detailed list of these options in the Orientation Menu Option from our website anytime. Many customers choose the basic clean as a maintenance option between deep cleans. However, since our cleanings are so detailed some actually choose it as a first cleaning option if their home is not too dirty. Basic cleans do not include cleaning inside appliances with the exception of the microwave. Windows, blinds, inside cabinets, and drawers are not included as well. Many customers choose this as the primary initial cleaning option and it literally includes everything. The deep clean applies to move in & move out cleans as well. Remember that we have more options such as carpet cleaning, outside windows, and more. If you want to customize further check out our Maid Clean By Design option in our website! Our core cleaning packages and the options available for your housekeeping needs.